So-called ‘space’ was born 13.7 billion years ago with a great explosion called the ‘big bang’. ‘Space’ born with the ‘big bang’was divided into four kinds of forces: G-force, strong force, weak force and electric force, immediately after the ‘big bang’began to make a circular motion. It is reported that ‘space’, where had been one-force space 13.7 billion years ago, began to make a circular motion after ramifying into four kinds of forces by the explosion. Then, light was born by pair annihilation, the collision of the positive matter of X particle with the antimatter, moreover, sound was born. It is ‘motion space of light and sound’ that we call ‘space’. Therefore, ‘static space of darkness and silence’ is ‘space’ of absolute stillness while it would be possible to say that ‘motion space of light and sound’ is relative ‘space’ between static and motion. The theory of relativity is neither the motion theory nor the static theory but the static and motion theory. I dare say the motion theory is the static and motion relative theory; the static theory is the absolute static theory. Albert Einstein’s ‘the theory of relativity’ has a special theory of relativity and a general theory of relativity. The special theory of relativity says that the speed of light is absolute velocity and there is nothing faster than the speed of light and maintains that everything except light is relative velocity. The general theory of relativity says that universal gravitation works on everything in ‘space’ where the speed of light is absolute velocity (C=constant) and the fact that universal gravitation works means it is motion ‘space’. The reason why the earth revolves around the sun is universal gravitation working between the sun and the earth, in other words the revolution of the earth was a result of getting caught in the warp of space by huge gravity of the sun. The theory of relativity is the quintessence of the motion theory, as physics is the motion theory though the theory of relativity is said to be the quintessence of modern physics. As described at the beginning, the motion theory is the static and motion relative theory, so the static theory also has to be included. Needless to say, the static theory must be based on the absolute static theory. We must describe the static theory first when talking about the motion theory. We must describe the law of absolute first when talking about the theory of relativity. My intention in this book lies in treating ‘static space of darkness and silence’ which is a founder of ‘motion space of light and sound’ we call ‘space’. What is ultimate limits of ‘space’ ? What is the infinite world? That’s my intension to describe them in this book. In a broad sense it is infinite space and endless time which include every existence, philosophy says it’s an orderly unifying world, physics says it’s space which contains every existing substance and radiation, and astrophysics says it’s space where all celestial bodies exist. It also says the extragalactic nebula is called the microcosm, space that includes them all is called macrocosm and the solar system space is especially called astronomical space. ‘Space’ means that time and space is vastness universe according to a philosophy book ‘Huainanzi’ written in the third century B.C. of the Qianhan times Liu Fang founded who defeated Xiang Yu after the Qin dynasty which unified China. It is also said ‘vastness universe’, ‘vastness’, ‘the world’, ‘everything in Nature’, or ‘universe’. However, what if ‘the world of everything in Nature or universe’ we thought to be ‘space’ is nothing but an image actually? If there is image ‘space’, there should be substance ‘space’. We can see the relation between image ‘space’ and substance ‘space’ when changing the viewpoint about the relation between image and substance. The movies we watch are an animation with sound reflected in a white screen. It is completely the same as ‘motion space of light and sound’ that we call ‘space’. Animation and sound reflected in the white screen are transmitted through the projection room in the rear of the audience and the film is just turning around there. The film is a still frame film, whose edge is connected to an audio tape, consists of sheets of snap shots. We audience watch the animation in the screen, listen to the sound through PA system, and empathize with it under an illusion that it’s real. It is just the same as misunderstanding and empathizing when we see and hear ‘motion space of light and sound’ we call ‘space’. Then, where on earth are the projector and the film in the projection room? Static ‘space’ certainly must be the projection room where there are the projector and the film. Now let’s get into the projection room. Everything moving is nothing but an image. Everything static is nothing but substance. Time is concerned only with motion ‘space’. F=mα, it is a motion equation. At first, there was an existing matter and next force (F) worked on it to cause acceleration (α), that is the mechanism of motion. Acceleration (α) was born of the four kinds of force; G-force, strong force, weak force and electric force, working on static matter (m) and began to move. That is the ‘big bang’. dL/dt=V・・・Distance (L=Length) differentiated by time (t) is velocity (V). dV/dt=α・・・Velocity (V) differentiated by time (t) is acceleration (α). Velocity and acceleration are nothing but the factor of motion, which are related to time. ‘Space’ is a spatiotemporal world of time and space consist of, that is just an explication adaptable only to motion ‘space’, but the time factor is inadaptable to static ‘space’. The concept of space-time can treat only of motion ‘space’. Motion ‘space’ is the image of an animation. Static ‘space’ is substance of a still frame film. Where there is a still frame film, there is an animation. Where there is substance, there is an image. Velocity and acceleration aren't absolute. The concept of space-time is nothing but images and illusions. It should be a key whether we take it fortuitous or inevitable that the conformity) between ‘the theory of relativity’ Einstein advanced 100 years ago and ‘Huainanzi’ in China 2,300 years ago. Physicists insist that the four kinds of force were subdivided immediately after the ‘big bang’, but it is illogical. The‘big bang’is to begin to move and can not begin to move without any force. The four kinds of force are just the concept of division the human beings made themselves. They are nothing but forces existing in ‘space’. They are nothing but universal gravitation. The force existing in static ‘space’ before the‘big bang’as well as motion ‘space’ after the‘big bang’ is universal gravitation. F(=mα) is open force which is adaptable to motion ‘space’ after the ‘big bang’. The force which is adaptable to static ‘space’ is closed force. Let's call the open force OF. Let's call the closed force CF. We simply call the turning from the closed force to the open force the‘big bang’. Static ‘space’ is the world of matters. Motion ‘space’ is the world of objects where matters move. Matter is just a film. Object is just an animation. Motion ‘space’ is reflected by the movement of static ‘space’ just like an animation is reflected by the movement of a still frame film. It is a projector that makes the film turn. The projector has a motor to turn and a lamp to give light. It is nothing but a converter to change the closed force into the open force to cause the‘big bang’. Chapter 14 "Only one space" or "Two spaces"
Chapter 23 The World of "Interval"
Chapter 31 Time Isn’t Substance But Just a Concept. Relative ‘space’ -"motion space of light and sound"- was born of the absolute cosmos -"static space of darkness and silence"- with the ‘big bang’. After the ‘big bang’ high-temperature and high-pressure ‘space’ has continued to expand (decline in its temperature and pressure) to reach 13.7billions light-years. It is ultimate phase transition. An H２O molecular compound is the absolute cosmos, "static space of darkness and silence", just before the ‘big bang’. By the ‘big bang’ an H２O molecular compound which is the absolute cosmos -"static space of darkness and silence"- reflected relative ‘space’ -"motion space of light and sound". It is the birth of the macrocosm of an H２O molecular compound. Continuing to expand (decline in its temperature and pressure), the macrocosm, an image, of an H２O molecular compound reflected relative ‘space’: steam of an H２O molecular compound. It is the birth of nebula (the galaxy) ‘space’ of an H２O molecular compound. Continuing to expand (decline in its temperature and pressure) to cause the phase transition at the 100℃ boiling point, nebula (galaxy) ‘space’, an image, of an H２O molecular compound reflected relative ‘space’: water of an H２O molecular compound. It is the birth of fixed star (the sun) ‘space’ of an H２O molecular compound. Continuing to expand (decline in its temperature and pressure) to flow between the 100℃ boiling point and the 0℃ melting point, fixed star (the sun) ‘space’, an image, of an H２O molecular compound reflected relative ‘space’: water of an H２O molecular compound. It is the birth of planet group ‘space’ of an H２O molecular compound. Continuing to expand (decline in its temperature and pressure) to cause the phase transition at the 0℃ melting point, planet group ‘space’, an image, of an H２O molecular compound reflected relative ‘space’: ice of an H２O molecular compound. It is the birth of earth ‘space’ of an H２O molecular compound. Continuing to expand (decline in its temperature and pressure) to flow between the 0℃ melting point and the -78.5℃ sublimating point, earth ‘space’, an image, of the H２O molecular compound reflected relative ‘space’: ice of an H２O molecular compound. It is the birth of moon ‘space’ of an H２O molecular compound. Continuing to expand (decline in its temperature and pressure) to cause the phase transition at the -78.5℃ sublimating point, moon ‘space’, an image, of an H２O molecular compound returned to the absolute cosmos of an H２O molecular compound: "static space of darkness and silence" just before the ‘big bang’. It is the completion of the circular motion of an H２O molecular compound. The ultimate phase transition and the phase transition of H２O molecular compounds are the same in mechanism. The ultimate phase transition of macro ‘space’ which is 13.7billions light-years large and the phase transition of micro ‘space’ of elementary particles are the same in mechanism. It completes the circular motion of birth, life and death according to the law of octave as the phase transition of triple states (three bodies/three phases). It is "the law of trinity", "dichotomy" and "the law of octave". The phase transition of medium ‘space’ that is an organic life -human being- is the same in mechanism. An organic life -human being- is the absolute cosmos, "static space of darkness and silence", just before the ‘big bang’. By the ‘big bang’ an organic life, human being, which is the absolute cosmos and "static space of darkness and silence" reflected relative ‘space’: "motion space of light and sound". It is the birth of the macrocosm of an organic life, human being. Continuing to expand (decline in its temperature and pressure), the macrocosm, an image, of an organic life, human being, reflected relative ‘space’: steam of an organic life, human being. It is the birth of nebula (the galaxy) ‘space’ of an organic life, human being. Continuing to expand (decline in its temperature and pressure) to cause the phase transition at the 100℃ boiling point, nebula (the galaxy) ‘space’, an image, of an organic life, human being, reflected relative ‘space’: water of an organic life, human being. It is the birth of fixed star (the sun) ‘space’ of an organic life, human being. Continuing to expand (decline in its temperature and pressure) to flow between the 100℃ boiling point and the 0℃ melting point, fixed star (the sun) ‘space’, an image, of an organic life, human being, reflected relative ‘space’: water of an organic life, human being. It is the birth of planet group ‘space’ of an organic life, human being. Continuing to expand (decline in its temperature and pressure) to cause the phase transition at the 0℃ melting point, planet group ‘space’, an image, of an organic life, human being, reflected relative ‘space’: ice of an organic life, human being. It is the birth of earth ‘space’ of an organic life, human being. Continuing to expand (decline in its temperature and pressure) to flow between the 0℃ melting point and the -78.5℃ sublimating point, earth ‘space’, an image, of an organic life, human being, reflected relative ‘space’: ice of an organic life, human being. It is the birth of moon ‘space’ of an organic life, human being. Continuing to expand (decline in its temperature and pressure) to cause the phase transition at the -78.5℃ sublimating point, moon ‘space’, an image, of an organic life, human being, returned to the absolute cosmos of an organic life, human being: "static space of darkness and silence" just before the ‘big bang’. It is the completion of the circular motion of an organic life, human being. The ultimate phase transition of macro ‘space’ which is 13.7billions light-years large, the phase transition of micro ‘space’ of elementary particles and the phase transition of medium ‘space’ of an organic life, human being, are the same in mechanism. The death only we human beings are afraid of is nothing but returning to the absolute cosmos, "static space of darkness and silence" just before the ‘big bang’, after an organic life, human being, gets into the phase transition at the sublimating point. Chapter 51 "Theory" and "Law"
The law of moving relative ‘space’ which is an image is merely a theory; however, the law of the absolute cosmos which is substantial and static is an absolute law. This is "the law of absolute" I’m just treating while that is "the theory of relativity". It is the law versus the theory. It is "the way of being" versus "the way of thinking". It is the natural "law" versus the artificial "law" which only applies to human society. The artificial "law" which only applies to human society is just "the partial view" of "the law of the relativity between whole and part" in earth ‘space’. The artificial "law" which is applied to only human society is just "mistaken dichotomy" (relative monism of utilitarianism) of "dichotomy" in earth ‘space’. The artificial "law" which only applies to human society is just the "the way of thinking" of "the way of being and the way of thinking" in earth ‘space’. The theory of relativity is just "the partial view" of "the law of the relativity between whole and part" in earth ‘space’. The theory of relativity is just "mistaken dichotomy" (relative monism of　utilitarianism) of "dichotomy" in earth ‘space’. The theory of relativity is just "the way of thinking" of "the way of being and the way of thinking" in earth ‘space’. The theory of relativity is just the artificial "law" which only applies to human society. The law of absolute implies "the total view and the partial view" of "the law of the relativity between whole and part" in earth ‘space’. The law of absolute implies "dichotomy" in earth ‘space’. 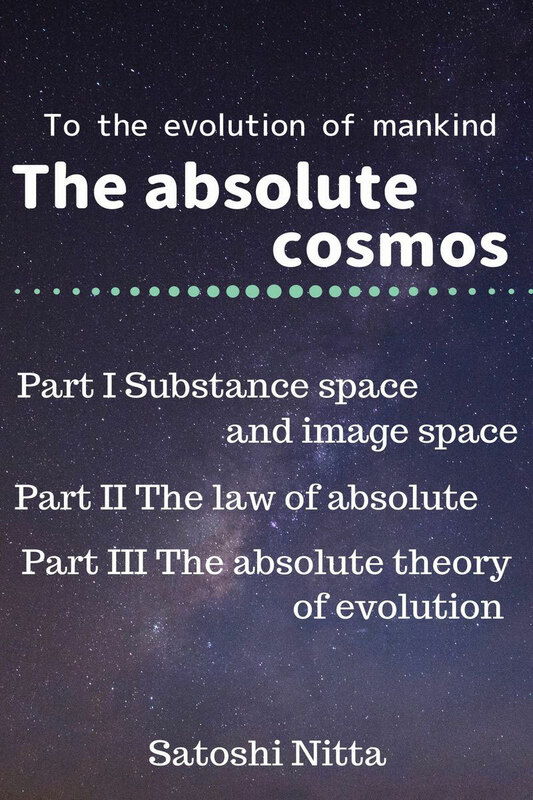 The law of absolute implies "the way of being and the way of thinking" in earth ‘space’. The law of absolute implies not only the natural "law" but the artificial "law" which only applies to human society. "Theory" is only for human beings who handle languages. "Law" is for all that exist in ‘space’. "Theory" can not surpass "law". Human beings subdivide "theory" into "social science" and "natural science". "Natural science" is a general term of learning, studying phenomena in the natural world (‘space’), and it describes and explains natural things on the basis of experiments, observations and mathematical principles. It evolves into "empirical science", demonstrating things by finding "law", and it is classified into astronomy, physics, chemistry, earth science, biology and so on. "Social science" is a general term of science, taking phenomena in human society as objects of study and subdivided into "humanities" by politics, economics, sociology, social psychology, education, history and ethnology relation science. "Humanities" is a general term of learning about general human culture such as politics, economy, society, history, literature and language and it is about history, philosophy, language and so on compared to "natural science" and "social science". "Cultural science" is another name of "social science" and "humanities". The history of mankind is that they have come to be an orphan in Nature (‘space’). "The theory of relativity" can not surpass "the law of absolute". It is the core of "the law of absolute". "The theory of relativity" makes "law" which only applies to medium ‘space’, human ‘space’ as organism, to be "theory". "The law of absolute" must be "theory" out of "law" which goes throughout micro ‘space’, medium ‘space’ and macro ‘space’. It is said that "The theory of relativity" is a "theory" which comes from "law" applied only to macro ‘space’. It is said that "the quantum theory" is a "theory" which comes from "law" applied only to micro ‘space’. Medium ‘space’ for an organic life (human being) must be applied to "theory" made by "law" which is applied to micro and macro ‘space’. It is a wrong approach. The forest can not be seen for the trees. The forest can not be seen for the trees from the viewpoint of science. It is better to overview the forest at first and look into each tree one by one afterward. "The law of absolute" is the forest. "Natural sciences" such as "the theory of relativity" and "the quantum theory", "social sciences", "humanities" and "cultural science" such as politics, economics, sociology, social psychology, education, historical science, ethnology, science of literature and linguistics are just one tree. The science is nothing but the studying to ramify. It is studying to ramify. The religion is nothing but the taught to organize. It is the taught to organize. The religion has been making friction and conflict and finally war. Chapter 74 The view of "only one space" and "Two spaces"
Chapter 77 The right view of "two spaces"
Chapter 78 The wrong view of "only one space"
Chapter 79 The right view of "only one space"
Sighting as motion is stillness and sighting as stillness is motion. The identification of misunderstanding (self identification) is this. Infinite ‘space’ is finite ‘space‘ 13.7 billions light-years expanse - substance ‘space’ is image ‘space’, static ‘space’ is motion ‘space’, the absolute cosmos is relative ‘space’, ‘static space of darkness and silence’ is ‘motion space of light and sound’ , the world of radix 1(n) is the world of exponent (1(n) ) and the world of radix 2(n) is the world of exponent (2(n) ). The world of n(n) = the world of nn is nothing but the identification of misunderstanding (self identification). We have been thinking that the world of n(n) is different from the world of nn. We have been thinking that the world of life is different from the world of death. We have been making journey of life riding on the train which is the name of time. We can sight the moving scenery outside the window however the scenery named space is static. We can sight the scenery named space as if it is moving, because the train named time is moving. An image (movie) reflected on the white screen at the stage is the scenery outside the window. A still frame films in the projection room is nothing but substance and an identification of a movie (animation). Real one riding on the train named time is nothing but real oneself sighting a movie at the audience seat. We have been sighting past/present/future outside the window that is continuance of "here" of space from "now "of time. Motion ‘space’ is the world of space sighting from time. Image ‘space’ is the world of space sighting from time. Relative ‘space’ is the world of space sighting from time. Static ‘space’ is the world of space. Substance ‘space’ is the world of space. The absolute cosmos is the world of space. Death is the ending of a movie by stopping (standing still) the rotation of the projector. Real one sitting at the audience seat has nothing to do with death. The one who had passed away as well as the one who has been living have been always sitting at the audience seat. To live at "now & here" is to change the seat of 4th floor (the world of substance, stillness and absoluteness) for real one from 3rd floor (the world of realty) and 5th floor (the world of sleep) for false one. Death is that moving scenery outside the window that is animation is to become static scenery that is still frame film for the train named time by stopping (standing still) at the station. Real one riding on the train named time has nothing to do with death. The one who had passed away as well as the one who has been living have been always riding on the moving train named time. To live at "now & here" is to stand still in the train named time by closing the curtain of the window. There is neither life nor death in the infinite ‘space’ - substance ‘space’, static ‘space’, the absolute cosmos, ‘static space of darkness and silence’ and the world of no life and no death is nothing but the world of the law of absolute. We human beings have been evolving as the earth has been evolving. The earth has been evolving as the solar system has been evolving. The solar system has been evolving as the sun has been evolving. The sun has been evolving as the galaxy has been evolving. The galaxy has been evolving as the nebula has been evolving. The nebula has been evolving as finite ‘space‘ 13.7 billions light-years expanse - image ‘space’, motion ‘space’, relative ‘space’, ‘motion space of light and sound’ has been evolving. Finite ‘space‘ 13.7 billions light-years expanse - image ‘space’, motion ‘space’, relative ‘space’, ‘motion space of light and sound’ has been evolving as infinite ‘space’ - substance ‘space’, static ‘space’, the absolute cosmos, ‘static space of darkness and silence’ has been evolving. The revolving of our human being shall not be reasoned from the creatures of the earth. We must argue about the ‘space’ evolution if we talk about the evolution of human beings. The absolute theory of evolution is nothing but the theory of ‘space’ evolution. Infinite ‘space’ - substance ‘space’, static ‘space’, the absolute cosmos, ‘static space of darkness and silence’ is the world of radix 1(n) = exponent (1(n)). Infinite ‘space’ - substance ‘space’, static ‘space’, the absolute cosmos, ‘static space of darkness and silence’ is the world which evolves in monism. Finite ‘space‘ 13.7 billions light-years expanse - image ‘space’, motion ‘space’, relative ‘space’, ‘motion space of light and sound’ is the world of radix 2(n) = exponent (2(n)). Finite ‘space‘ 13.7 billions light-years expanse - image ‘space’, motion ‘space’, relative ‘space’, ‘motion space of light and sound’ is the world which evolves in dichotomy. Infinite ‘space’ - substance ‘space’, static ‘space’, the absolute cosmos, ‘static space of darkness and silence’ is not continuum with finite ‘space‘ 13.7 billions light-years expanse - image ‘space’, motion ‘space’, relative ‘space’, ‘motion space of light and sound’. The‘big bang’is the evolution with non continuum. It is said that is the evolution from nothingness to thingness. The law of octave claims the evolution from nothingness to thingness and contains the law of trinity and dichotomy. Finite ‘space‘ 13.7 billions light-years expanse - image ‘space’, motion ‘space’, relative ‘space’, ‘motion space of light and sound’ was born by the ‘big bang’ from infinite ‘space’ - substance ‘space’, static ‘space’, the absolute cosmos, ‘static space of darkness and silence’. It is said that is the evolution from nothingness to thingness with non continuum. The female of human being is nothing but infinite ‘space’ - substance ‘space’, static ‘space’, the absolute cosmos, ‘static space of darkness and silence’. An evolution from nothingness to thingness was made by the ‘big bang’ and then new life which is finite ‘space‘ 13.7 billions light-years expanse - image ‘space’, motion ‘space’, relative ‘space’, ‘motion space of light and sound’ shall be born. Finite ‘space‘ 13.7 billions light-years expanse - image ‘space’, motion ‘space’, relative ‘space’, ‘motion space of light and sound’ shall be evolving again within ten months and ten days which is a pregnancy period. That the ancestor of mankind is not only finite ‘space‘ 13.7 billions light-years expanse - image ‘space’, motion ‘space’, relative ‘space’, ‘motion space of light and sound’ but also infinite ‘space’ - substance ‘space’, static ‘space’, the absolute cosmos, ‘static space of darkness and silence’ is the proof. We have been making perverse journey of life riding on the train which is the name of time. Beyond static/motion ‘space’ is your own world in the train. Beyond substance/image ‘space’ is your own world in the train. Beyond absolute/relative ‘space’ is your own world in the train. To live at "now & here" is to change the seat of 4th floor [beyond substance/image ‘space’, beyond static/motion ‘space’ and beyond the absolute/relative ‘space’ where it is possible to overview both the scenery (screen) behind the stage which is the world of image, motion and relative, and real stage which is the world of substance, stillness and absoluteness] for real one from 3rd floor (the world of realty) and 5th floor (the world of sleep) for false one. Death is nothing but to leave the train named time where we have been making perverse journey of life. Real one left the train named time has nothing to do with death. There is neither life nor death in the beyond finite/infinite ‘space’, beyond substance/image ‘space’, beyond static/motion ‘space’, beyond the absolute/relative ‘space’, ‘beyond static/motion space of beyond light/darkness and beyond silence/sound’ which is the world of beyond ‘space’ at radix 3(n) = exponent (3(n)) and the world without life nor death is nothing but the world of the law beyond absolute and relative. The evolution of mankind goes by as the population increase. The history of rapid increasing of population started at 20th century. The population at 1900 is 1.6 billion. The population at 1950 is 2.5 billion. The population at 1960 is 3.0 billion. The population at 1970 is 3.7 billion. The population at 1980 is 4.5 billion. The population at 1990 is 5.3 billion. The population at 2000 is 6.1 billion. The population at 2006 is 6.5 billion (increasing ratio = 150/min, 200,000/day, 80million/year). The population at 2050 is 9.2 billion. Men of today are 32nd generation. The 32nd generation was born at from 1970’s to 1990’s when the population was exceeding by 232 =4, 294, 967, 296 human beings. The 31st generation was born at from 1900’s to 1940’s when the population was exceeding by 231=2, 147, 483, 648, human beings. The 33rd generation who is a new mankind will be born at from 2030’s to 2040’s when the population will be exceeding by 233 =8, 589, 934, 592 human beings. It was in between the 1940’s and 1970’s when we human beings fell into the traps of "the relative monism of utilitarianism" which was a wrong view of "only one space". It should be in between the 1990’s and 2030’s when we human beings should first come back to a right view of "two spaces" from a wrong view of "only one space". It should be after the 2040’s when we human beings should be able to evolve from a right view of "two spaces" to a right view of "only one space". It was in between the 1940’s and 1970’s when we human beings fell into the traps of the theory of relativity. It should be in between the 1990’s and 2030’s when we human beings should first come back to the theory of absolute relativity from the theory of relativity. It should be after the 2040’s when we human beings should evolve from the theory of absolute relativity to the law of absolute. It was in between the 1940’s and 1970’s when we human beings fell into the world of finite ‘space‘ 13.7 billions light-years expanse - image ‘space’, motion ‘space’, relative ‘space’, ‘motion space of light and sound’ which is the world of "thingness" at radix 2(n) = exponent (2(n)). It should be in between the 1990’s and 2030’s when we human beings should first come back to the world of infinite ‘space’ - substance ‘space’, static ‘space’, the absolute cosmos, ‘static space of darkness and silence’ which is the world of "nothingness" at radix 1(n) = exponent (1(n)) from the world of finite ‘space‘ 13.7 billions light-years expanse - image ‘space’, motion ‘space’, relative ‘space’, ‘motion space of light and sound’ which is the world of "thingness" at radix 2(n) = exponent (2(n)). It should be after the 2040’s when we human beings should evolve from the world of infinite ‘space’ - substance ‘space’, static ‘space’, the absolute cosmos, ‘static space of darkness and silence’ which is the world of "nothingness" at radix 1(n) = exponent (1(n)) to the world of beyond finite/infinite ‘space’, beyond substance/image ‘space’, beyond static/motion ‘space’, beyond the absolute/relative ‘space’, ‘beyond static/motion space of beyond light/darkness and beyond silence/sound’ which is the world of beyond ‘space’ at radix 3(n) = exponent (3(n)). It should be beginning of the law of beyond ‘space’ evolution. We human beings seem to be living in the perverse world. The perverse world could be said image ‘space’ or motion ‘space’ or relative ‘space’. It is nothing but perversion to think image as substance. It is nothing but perversion to think dream as realty. It has been our human beings to make perverse evolution. It is nothing but degeneration which is perverse evolution to think image as substance. It is nothing but degeneration which is perverse evolution to think dream as realty. It is nothing but degeneration which is perverse evolution for human being’s evolution. Should we understand that our real human being’s parent is not our mother and father but only the earth, we will be able to reach the conclusion of the law of beyond ‘space’ evolution which unify the real theory of ‘space’ and evolution. It is the proof that we come back to the mother earth when we die. Since the purchase page of each shop opens from the link below, I would appreciate your favor. The PDF version is DRM (Digital Rights Management) free. If you download it, you can read it on all PCs, tablets and smartphones, and you can also make paper copies of the pages you need. We look forward to posting "Customer Reviews" and "Comments" on each dealer's page. Copyright(c) 2018 Heisei Seminar All rights reserved.